Why is there no 1.7.10 version of this mod i play mc modded 1.7.10 and would like to add this mod. I don't mean to sound rude but the reason there isn't a 1.7.10 version is because it's a brand new mod and making a brand new mod for a 2 1/2 year-old minecraft release is a silly thing to do. Maintaining a mod like this over several version would also be silly, due to the amount of time it would take for very different code, especially with regards to rendering. I get that a lot of mods stopped updating after 1.7.10 but it's time to move on, mods are updating and the world turns, you're going to have to choose between old mods and new mods an increasing amount from here on in, man. The one problem i have with this mod is that a circuit only have 4 connections to the outside world, (yes you can connect multible curcuitboards and get more connections, but it isnt always the nicest thing). 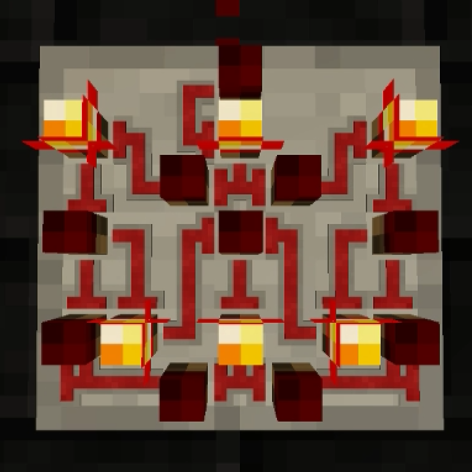 I see two possible fixes for this, either make big (world size) bundled/colored cable, making it easy to extend multible ind/outputs, or make wireless redstone, maybe in the form of only world to curcuit connections (so curcuits cant interconnect with itself wia the wireless module) or make the wireless module kinda big/have a high complexety value, so it wouldnt be usefull to connect the same curcuit to itself. Thanks for the reply! will check out you twitter then. it would be nice with some kind of signal blocker, so that you can block and entire bundled cable at once, instead of having to pull out each color seperately and block them, and maybe a bundled constant (giving seperate value to all colors or giving one value to chosen colors). I've had requests for similar stuff in the past and the answer is always the same: circuits in circuits! As you can probably understand, from a design perspective it's never good to over-bloat things, which, apart from compactness, is what circuits in circuits are for. I could add so many components to SCM to fill multiple pages in JEI, but I've decided not to and instead let users create those themselves. A signal blocker is easy enough to do with either 2 NOT gates (just two torches) or an analog subtractor, and you can just repeat it multiple times, one for each bundled channel. You can build that as a standalone circuit and then place it inside another one to act as the component you want. Looks like you either have a corrupted or invalid jar for Applied Energistics in your mods folder. That crash doesn't even mention SCM. Amadornes, How do you make a logo like that ? I would like to request (and have a need for) an L plate that can be rotated any direction. I need to go from horizontal to vertical with multiple colored wires and the ribbon wire. It would also be nice to go "around" a block with wires and ribbon. The only way I have figured out how to split out the 16 color cables from a ribbon and go from horizontal to vertical (or visa versa) is to make 16 plates wide, lay down the the ribbon cable and have one of the colors per block pass the redstone signal to another plate and then bring them back together... (takes up way too much space since this mod is about compacting logic, gates, etc.). The other request is to be able to rotate a "chip" on a plate. It is hard to figure out which way it is placed in "tiny" form. This mod rocks by the way! My Minecraft buddies and I have built a bunch of large scale board games (Checkers, Connect 4, etc.) and the redstone logic is insane. Almost impossible in Vanilla MC. Command blocks helped this but inputs, outputs, and logic is the core that takes up so much room. ive said this before but i really like this mod will wireless redstone be getting added or not for this mod? OpenGL: AMD Radeon HD 7620G + HD 8670M Dual Graphics GL version 4.5.13399 Compatibility Profile Context 15.200.1065.0, ATI Technologies Inc.
YEAH THAT MOD IS AWESOME !!! One Question: Is there a way to name your integrated circuits like the pre-made ones? In an anvil you can rename a Blueprint copy of your circuit. Haven't tried the circuit itself yet. 1.7.10 is outdated for two years. Shame I can't upvote/like your comment, I was thinking the exact same. Soooooo many great mods... for 1.7.10. However, I've heard upgrading from 1.7.10 to 1.8 is difficult, so going from 1.10.2 to 1.7.10 must also be difficult. I really hope amadornes can, though!